It is now the third week of the murder trial of Oscar Pistorius in Pretoria, South Africa. There is a daily update worldwide on what has happened during the day in the courtroom as the trial progresses, with seemingly new and disturbing information brought with the update. The trial has so far seen reconstructions of Pistorius’ bathroom, where the shooting took place, graphic descriptions and images of the autopsy, details of Pistorius’ love for guns, as well as a host of witnesses and friends of both the accused and the victim. As this trial becomes more and more of a media sensation, particularly in the nation of the trial, South Africa, but equally so worldwide, it’s worth going back to the beginning, and attempting to understand exactly what is going on as more and more images of the now infamous courtroom are projected onto our television screens each and every night. Oscar Pistorius became internationally renowned for his amazing athletic achievements. Not only was he an amazingly fit and talented athlete, his accomplishments in sprinting were made even more remarkable and inspirational given that both of his legs were amputated below the knee when he was just eleven months old, after he was born with fibular hemimelia, a congenital absence of the fibula in both legs. 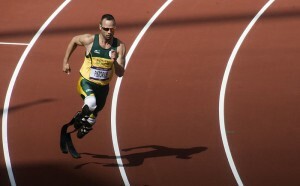 Pistorius became a champion in both competitive events for below-knee amputees as well as events for able-bodied athletes. He is a Paralympic champion in the 100, 200 and 400 metre sprints at the 2008 Beijing games, and the Paralympic record holder for his division of T44 (single below-knee amputees, even though he is classified in T43: double below knee amputees). He also won gold and attained the world record at the 2012 London Paralympics for the 4 x 100 metre relay. These are among a host of other athletic achievements in National Championships, World Championships, World Cups and Physically Disabled Athletic events. In 2012, Pistorius also competed in the London Olympics for the able-bodied 400 metre sprint, and finished in sixteenth place in the first round out of 51 athletes. Pistorius became an iconic athletic figure, with many major sponsorship deals with such famous brands as Nike, Oakley, Thierry Mugler and BT. His nickname on the world stage became “Blade Runner” due to his artificial limbs and his inspirational athletic achievements. He was a major celebrity in his home country of South Africa. However, in the early morning of Valentine’s Day 2013, Pistorius was headline news for something very different to his athletic achievements – his girlfriend of several months, model Reeva Steenkamp, was shot and killed by Pistorius at his Pretoria home. Pistorius acknowledged that he was responsible for Steenkamp’s death, saying that he mistook her for an intruder. Pistorius was taken into police custody and formally charged with murder the following day. On February 25 of this year, the murder trial was formally underway, to huge media attention worldwide. The trial has received much attention in South Africa, with an entire television channel dedicated to the court proceedings, with the entire trial broadcast live by audio, and parts of the trial broadcast live via television. Many of these images have been broadcast either in audio, photographed or live film form worldwide also. The trial has had several significant moments which suggest that Pistorius may be guilty of more than mere mistaken identity. In particular, the reconstruction of the bathroom of the morning of the shooting, given the amount of bullets fired, and the trajectory of said bullets. Evidence given at the trial seems to show that Pistorius has an obsession with guns. There has also been suspicious evidence given in the recent days of the trial which suggest the moving of evidence and tampering of the crime scene by the police. The trial is scheduled to finish in the coming days, and it appears no clearer as to the true events of what happened over a year ago in the Pretoria home. This murder trial and its mass media component are important for us to consider in many ways. The first, and most prominent of these is the issue of domestic violence, particularly intimate partner violence. This is an issue that the world has faced for far too long, often going unreported or even unclaimed. It is important that we acknowledge that, as much as the true details of what happened may be sketchy at this time, the one thing we do know is that there has been a death of an innocent victim by very violent means. In whatever way Pistorius will be found guilty, it is important that we acknowledge that he is, in fact, guilty of an immense crime. Although the media focus on Pistorius is, at times, sickening (the documentation and furious photography of him vomiting multiple times in the courtroom as details of Steenkamp’s autopsy were read), this media attention is important. We need to be careful at just how this attention is directed. It is very important that such a significant issue is being given such media attention, where it is often not acknowledged at all. However, the attention directed at Pistorius is difficult to reconcile, especially if he is found to be guilty of murder. We need the attention to be given to the issue and not to a perpetrator of the issue. We need the message to be very clear – whoever you are, whatever you do, violence is unacceptable and will not be rewarded. This entry was posted in Featured, News and tagged domestic violence, featured, News, sport. Bookmark the permalink.